You come to us for results. Our expertise delivers. As any of our clients will tell you, we care deeply about the people we train and we are passionate about the results we deliver. Our private personal training gym provides an inspiring atmosphere that is not at all daunting, even if the last time you exercised was back when a Commodore 64 was cutting edge tech and everyone thought heart healthy omelettes were cool - yes, that long ago. The Optimised approach is comprehensive, holistic, science based and research driven, delivered within our luxury, state of the art facility in the heart of Manchester city centre. The often life changing results we achieve are the result of a special partnership; between clients who recognise the need for change and have taken the decision to do what is needed, and the expert, friendly team of trainers, strength coaches and nutritionists at Optimised Personal Wellness. Our commitment to you, and our desire for you to succeed in maximising your unique potential creates an environment and client experience where outstanding results are within your grasp. Whatever challenges you face, our dedicated team is on hand to support, motivate and inspire you every step of the way. 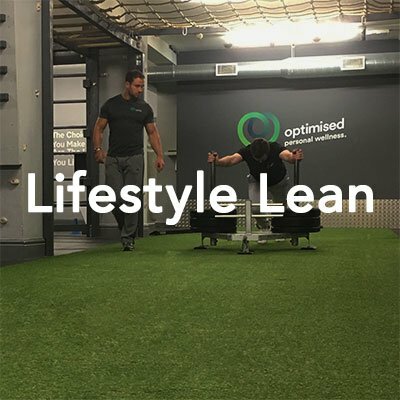 Personal training with Optimised is inclusive, not intimidating in the slightest, but it's not for everyone - we expect and demand that you give your personal best, while appreciating that everyone has different demands and life circumstances. If you want a run-of-the-mill trainer who does not care and is not passionate about your results, you won't need to look far.